Berkeley artist Deborah Harris created the block print for the covers of The Greening trilogy. Leaves have already begun to fall in my backyard. The sunflowers are still smiling on their ten-foot-stalks, seemingly unaware of the change in the tilt of the planet, yet the leaning season has begun, when autumn exerts its downward pull on all the growing world. There’s something strangely invigorating about the autumnal shift. Perhaps the shortening days, the cooler nights, are meant to remind us that the clock is ticking. Mother Nature’s countdown is stately and subtle, but the message is clear. Our time on Earth is finite. Whether or not Earth itself is finite is another question, one hotly debated in environmental and scientific circles. But for those of us who take a more abstract, romantic view of life, the possibilities for Earth’s future offer a ripe area for speculation. In my new alt-fantasy series The Greening, I imagine a slightly less dystopian vision than some. I’d like to think that future generations won’t be condemned to live in a dark dank world overrun with mutant cyber-human hybrids whose idea of a good time is drinking themselves to death in some seedy bar. Not that there’s anything wrong with that, if that’s your cup of tea. But as for me, I’ll take the road where the jolly innkeeper isn’t a psychopath. 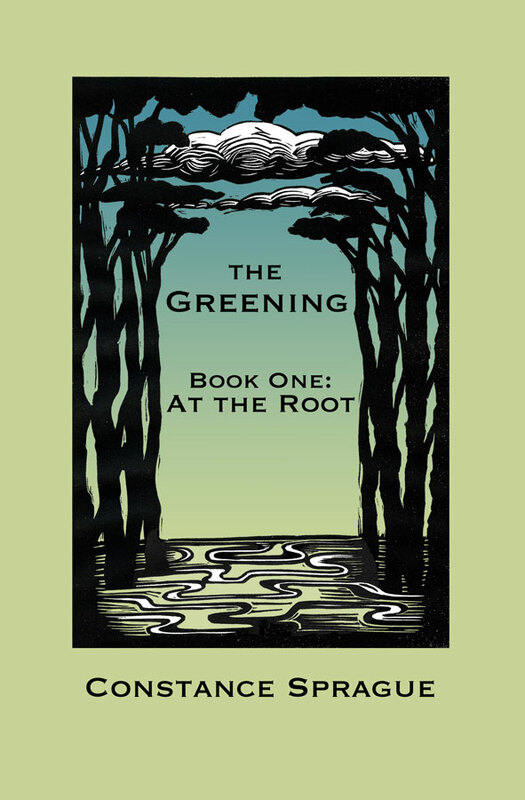 The first volume of The Greening trilogy starts At The Root, where all forests begin. The tale centers on the struggles of a young woman who sets off on a quest to find her missing father and stumbles into a world of magic and mayhem. But really, at its heart, it’s about growing up and finding your way through the forest. And, like a ten-mile hike in the great Northwest, it’s more fun than it sounds. I floated an earlier version of this story out on the web for free last fall, as an experiment. I learned some things from it. One of which was that the story I wanted to tell was too big for one volume. And that I wasn’t content with an e-book only project. This slowed the process considerably, as it led to more extensive editing and design considerations, but now, here we are, and the paperback is in stock at Amazon. An e-book version will follow in the coming months. So, if you’re looking for something leafy, green and not too filling for your leisure reading, consider a walk in the Green Wood.